CONVOY — Crestview’s nine game winning streak came to an end with a 51-46 loss to Wayne Trace at Ray Etzler Gymnasium on Monday. The two teams will square off again in the Division IV sectional finals February 23 at Paulding, but only if Crestview defeats Continental in the semifinals on February 19. Crestview (13-6) trailed 45-39 entering the fourth, but a free throw by Bailey Gregory, a trey by Lexi Gregory and a foul shot by Reagan Hammons pulled the Lady Knights to within one, 45-44 with 4:35 left. Wayne Trace’s Kaylee Shepherd answered with a pair of free throws, but a bucket by Olivia Cunningham with 4:00 left made it a 47-46 game. 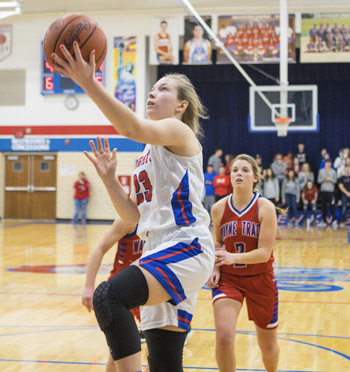 That basket would be the final time Crestview would score and Wayne Trace (18-3) didn’t crack the scoring column again until the 49 second mark, when Claire Sinn converted two free throws. Sinn and Miriam Sinn would each add another foul shot to close out the scoring. After trailing 12-5 after the first quarter and 29-23 at halftime, Lexi Gregory’s trey early in the third quarter pulled the Lady Knights to within two, 32-30, but Wayne Trace’s Miriam Sinn promptly responded with a basket and foul shot to make it 35-32. From there, Kaylee Shepherd and Claire Sinn each scored buckets and it appeared the Lady Raiders were ready to seize control at 39-30. Gregory poured in two more triples and Olivia Cunningham had one, but Katrina Stoller and Claire Sinn scored the final four points of the quarter to give Wayne Trace a six point advantage heading into the final period. The Lady Raiders were 16 of 44 (36 percent) from the floor and 14 of 21 from the foul line, while finishing with 22 rebounds and 10 turnovers. Crestview was 14 of 35 (40 percent) from the floor, including 10 of 18 from three point range. The Lady Knights were 8 of 13 from the foul line and had 17 rebounds and 18 turnovers. Lexi Gregory finished with a game high 22 points, including five treys, and Cunningham scored 14, with 12 of those points coming on triples. Claire Sinn led Wayne Trace with 15 points and Sadie Sinn and Shepherd also finished in double figures with 11 and 10 points respectively. Crestview will finish the regular season at home against Spencerville on Thursday, while Wayne Trace will close the regular season at home against Hicksville the same night.